We stay here often whenever we come to the valley as it’s within walking distance to Brunswick St and always a clean and pleasurable stay. Clean and eficient. Breakfast could have been better. Overcooked bacon and cold eggs. Clean and comfortable room. Facilities a bit dated. Convenient car parking. Nice place to stay. Value for money. The carpark is a disaster tho, horrible design with columns in the middle of the carriageway, drive carefully though it and hope you have a tiny car. Very central, cheap and clean. Good value for the cost and the restaurant \ bar connected to the property is a great place to eat or just for a drink. Nice place and near to destinations we need to see during our stay. I liked how big the apartment was. It had plenty of space and I was not expecting that. I didn't like the price of parking, hence why I parked for a fraction of the price elsewhere. If you've ever scanned your friends' social media and thought your life was dull, get some payback with a stay in Spring Hill. 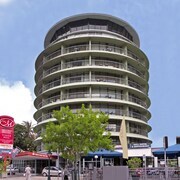 Situated 1 kilometre from central Brisbane, it's a fantastic place to base yourself while exploring Queensland's capital. Whether your trip is fast and loose or your pace is more relaxed, you'll find plenty to do, see and discover. Visit some of Brisbane's best attractions, like Queen Street Mall, the Brisbane Convention and Exhibition Centre and Roma Street Parkland. 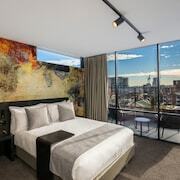 You can stay near Queen Street Mall at a number of accommodations, including the Emporium Hotel, Spicers Balfour Hotel, Brisbane Marriott Hotel, Quest River Park Central and Hilton Brisbane. Hawthorne Ferry Terminal is both a working passenger boat depot and an attraction in its own right. 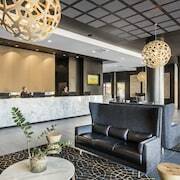 The Brisbane Riverview Hotel and Domain Serviced Apartments are some of the most popular places to spend a night or two close by. Take a break from the hustle and bustle by visiting New Farm Park. Do you need somewhere to turn in close to here? 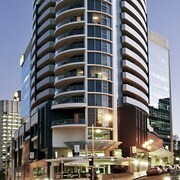 The Royal Albert Hotel and Mantra On Mary are favourites with many visitors. Everyone has holiday horror stories about the lumpiest mattress you can imagine and creepy-crawly infestations. But trust us, cheap doesn't have to mean nasty. 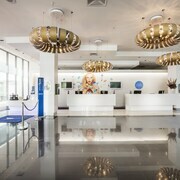 There's a ton of budget hotels here, and our favourites are the Holiday Inn Express Brisbane Central and Art Series - The Johnson. You really don't need fluffy bathrobes, a delicious room service menu and Egyptian cotton sheets all of the time (that said, it can be nice sometimes, right?). 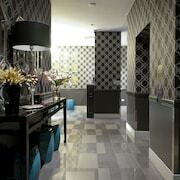 The deluxe options here include the Republic Apartments and Oxygen Apartments. Away with your mates but need a bit of a break? Fancy just chilling out with a magazine and a steaming hot coffee? Then why not find a quiet corner in Union Street Espresso Bar? Trust us, you'll need some decent grub after all that sightseeing. Luckily, Domino's Pizza Spring Hill has a delicious menu which will really fill you up! If all that tucker has left you feeling like a beer or two, Tumbling Stone Restaurant & Bar is just a stone's throw away. It's an awesome place to pull up a stool and chat with the locals! Can't snag the ideal Spring Hill hotel? 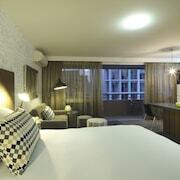 Don't tear your hair out — there are stacks of options in Brisbane and Brisbane Central Business District. Sure, we can't really fault take-away food apps and streaming sites, but occasionally you've just gotta get out of the house! Make some new memories on an awesome adventure with a bit of guidance from lastminute.com.au.